DEAR MAYO CLINIC: I notice a lot of food products, including cereals, no longer use artificial colors. Is this because food dyes are harmful? ANSWER: There’s no solid evidence that artificial colors in food cause health problems. But there aren’t any health benefits associated with artificial colors, so removing them from foods isn’t a bad idea. When you consider color in your food, though, rather than focusing on artificial color, look to foods’ natural colors as a guide. Including food with a variety of natural colors can help you get a range of healthy vitamins and nutrients in your daily diet. In the U.S., the U.S. Food and Drug Administration, or FDA, regulates the additives that can be put into food, including artificial colors. Before any additives are used in food, the FDA puts them through a rigorous approval process to ensure safety. That doesn’t mean there is no risk, however. Total safety can’t be guaranteed. For example, certain artificial colors may trigger allergic reactions in some people. Instead, the FDA uses a standard of “reasonable certainty of no harm” with typical use when considering whether an additive should be approved. All the additives in the foods you find in your local grocery store have met the FDA’s safety standards. But, as you note, some companies are choosing to take artificial colors out of foods such as breakfast cereals. That decision likely is driven not by safety concerns or scientific evidence, but rather by market demand for such a move. Many consumers are interested in reducing the amount of additives in their foods, and, with that in mind, they gravitate toward those without artificial colors. In addition, by removing the artificial colors, companies may be hoping to make the foods appear more “natural,” even though many are still highly processed. Artificial colors usually are added into foods to make the food more appealing. As part of human preference, we are apt to eat more when there is more variety in our food, and that includes a variety of color. Bright hues in food tend to increase our appetite for them. You can take advantage of that preference for variety as you choose a healthy diet. Instead of foods that are colored with artificial additives, look for foods that are naturally colorful. 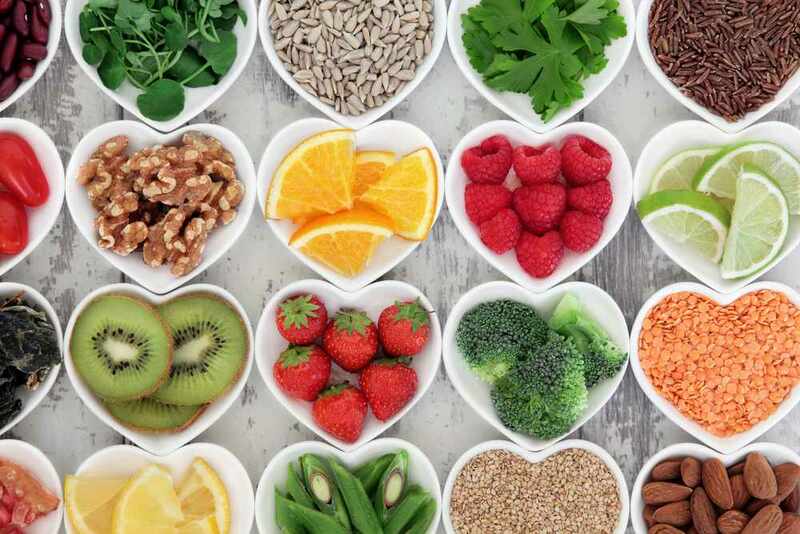 Red strawberries and raspberries; purple cabbage and eggplant; orange carrots and tangerines; yellow peppers and lemons; and many kinds of green, leafy vegetables are all examples of colorful, healthy food choices that provide a wide range of nutrition your body needs daily. Another benefit to including lots of naturally colorful foods in your daily meal planning is that many of them are fruits and vegetables low in energy density. That means larger portions have a smaller number of calories, compared to foods higher in energy density that have many calories in smaller portions. You can eat more of the foods lower in energy density and feel full with fewer calories.